For a bit of a comparison, check out the ridiculous amount stuff crammed into a Texas Instruments OMAP 5 processor that’s designed for cell phones. Also, you have to check out the picture of Roger Amidon’s computer “Spider” on the fourth page. Most people I meet are under the mistaken notion that personal computing started only two or three years ago, with the introduction of the Altair 8800 by MITS. Nothing could be further from the truth. In fact, the amateur computing hobby was then almost ten years old. I therefore decided to write this article to set the record straight, give credit to the early pioneers in this hobby and shed some light on the early history of microprocessors. If one could find a specific date for the birth of personal computing, it would be May 5 1966. 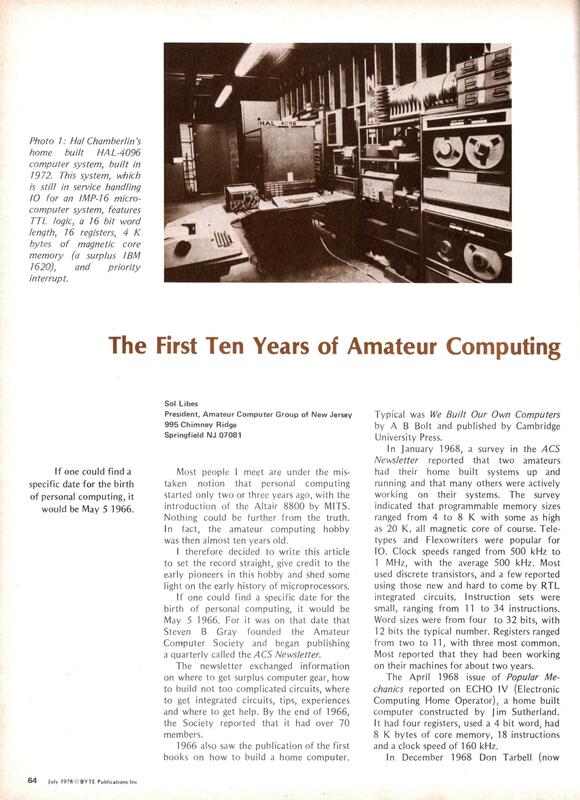 For it was on that date that Steven B Gray founded the Amateur Computer Society and began publishing a quarterly called the ACS Newsletter. The newsletter exchanged information on where to get surplus computer gear, how to build not too complicated circuits, where to get integrated circuits, tips, experiences and where to get help. By the end of 1966, the Society reported that it had over 70 members. 1966 also saw the publication of the first books on how to build a home computer. Typical was We Built Our Own Computers by A B Bolt and published by Cambridge University Press. In January 1968, a survey in the ACS Newsletter reported that two amateurs had their home built systems up and running and that many others were actively working on their systems. The survey indicated that programmable memory sizes ranged from 4 to 8 K with some as high as 20 K, all magnetic core of course. Teletypes and Flexowriters were popular for IO. Clock speeds ranged from 500 kHz to 1 MHz, with the average 500 kHz. Most used discrete transistors, and a few reported using those new and hard to come by RTL integrated circuits. Instruction sets were small, ranging from 11 to 34 instructions. Word sizes were from four to 32 bits, with 12 bits the typical number. Registers ranged from two to 11, with three most common. Most reported that they had been working on their machines for about two years. The April 1968 issue of Popular Mechanics reported on ECHO IV (Electronic Computing Home Operator), a home built computer constructed by Jim Sutherland. It had four registers, used a 4 bit word, had 8 K bytes of core memory, 18 instructions and a clock speed of 160 kHz. In December 1968 Don Tarbell (now known for his high speed tape cassette interface) reported on his home built computer in the ACS Newsletter. It had a 4 bit word size, four registers, 10 kHz clock and was constructed using RTL integrated circuit logic. He used a Teletype for IO. In 1967, Dave Digby ran an ad in CQ magazine offering a computer kit. It was advertised as featuring RTL logic, four registers, a 512 to 1024 byte delay line memory, and serial input and output. The price was $1000. As far as I know, he never delivered any units. Most early builders constructed copies of the Digital Equipment Corporation’s PDP-8 minicomputer with their own modifications. In the surplus area, 1000 Minute-men I missile guidance processors became available in 1971. 1971 also saw the introduction of the first computer kit. It was part of the National Radio Institute’s course on computer electronics. It used 52 TTL integrated circuits, had a 32 by 8 bit integrated circuit memory, 15 instructions and an operator’s panel, and it sold for $503. Louis E Frenzel, then of NRI and now at Heathkit, was the designer. In late 1971, the Kenback Corporation introduced the Kenback-1 computer for $750. It was intended primarily for educational use. It had a 1 K byte MOS shift register memory made by a small, young integrated circuit manufacturer called Intel. It also had three registers, an 8 bit word size, 65 instructions, operator’s panel, and an audio cassette for program storage. The December 1971 issue of Computers and Automation described five home built computer systems. And by the end of the year 1971, there were reported to be 195 members in the Amateur Computer Society. In 1972 things continued to pick up. In June Don Tarbell reported that he had written an editor program for his new home built system and was working on an assembler program. His system used an 8 bit word, 16 registers, and 4 K bytes of core memory. Early 1972 saw the introduction of the 8008 microprocessor, by Intel, the opening of a number of used computer equipment stores, large price drops in TTL logic and the availability of the 1101 programmable memory at low cost. All of this proved to be a tremendous stimulus for amateur computer experimenters. In the September 1972 issue of the ACS Newsletter Hal Chamberlin reported on his home built HAL-4096. This 16 bit machine utilized surplus IBM 1620 core memories. Hal furnished a complete set of construction plans for $2. The system had 16 registers, priority interrupt, Selectric and paper tape IO, and many other very advanced features. The September 14 1972 issue of Electronic Design carried an article on how to build a circuit which would display 1024 ASCII characters on a TV set. In 1973 amateur computing advanced in several areas. In May, the EPD company advertised the System One computer kit for $695. It had 1 K bytes of memory with expansion to 8 K and contained 82 integrated circuits. It had 57 instructions encoded in a diode matrix read only memory. The September 1973 issue of Radio Electronics published Don Lancaster’s plans for the construction of the TVT-1. Although intended as a TV typewriter, many enterprising experimenters interfaced it to modems and home built computers. In late 1973, the Scelbi Computer Consulting Company introduced the first computer kit using a microprocessor. The kit was called the Scelbi-8H and it sold for $565. It used the Intel 8008 and had 1 K bytes of integrated circuit programmable memory. It was expandable to 16 K bytes of programmable memory ($2760) and had options such as cassette IO, ASCII keyboard input, oscilloscope output and serial IO. In 1973, Digital Equipment Corporation offered the PDP-8A with 1 K words of 12 bit programmable memory for $875. Also in 1973, a small publishing house catering to computer and digital electronics hobbyists began publishing with a book on wire wrap construction techniques. It was called M P Publishing Company and was a part time activity of Carl Helmers (who later began a monthly called Experimenters’ Computer System which after five issues was transformed into BYTE in 1975). 1974 marked a year of substantial increase in amateur computing. In July, Radio-Electronics magazine carried a construction article by Jonathan Titus on building the Mark-8 processor, which used the Intel 8008 microprocessor. It is estimated that over 500 of these units were built by avid experimenters. In October, Southwest Technical Products Company (SwTPC) introduced the TVT-II kit for $180 and an ASCII keyboard kit for $40. 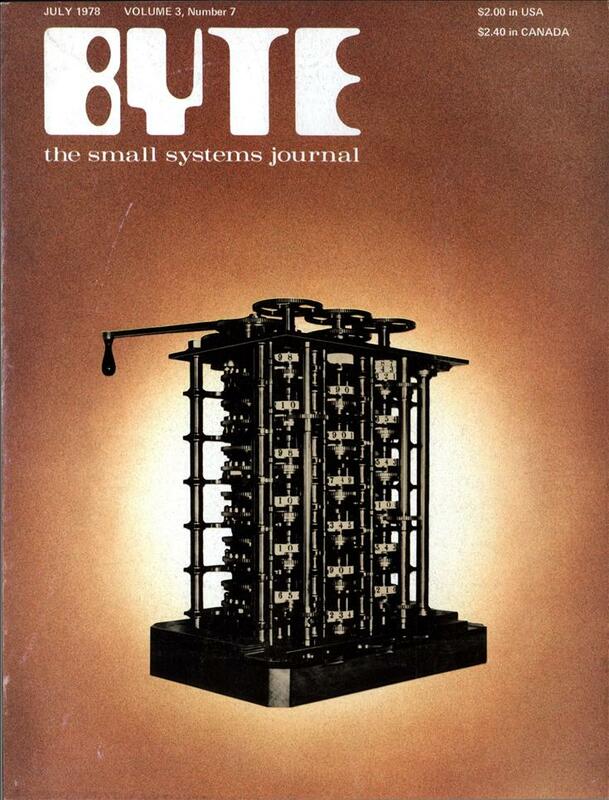 In September, Hal Singer started the Micro-8 Newsletter to exchange information among hundreds of experimenters who were building the Mark-8 unit. In November 1974, Hal Chamberlin and some associates began another very popular but short-lived magazine called The Computer Hobbyist. 1975 was the year that personal computing exploded. It began, in January, when Popular Electronics carried an article on the Altair 8800 microcomputer by MITS. First deliveries were in April 1975. The kit sold for $375 and included 1 K bytes of programmable memory, but no IO. MITS claims that by the end of 1976 they had sold over 10,000 Altair 8800s (80% to hobbyists). In April, the first computer club held its meeting. Started by Bob Reiling and Gordon French, and calling itself The Homebrew Computer Club, it met in Menlo Park CA. One month later the Amateur Computer Group of New Jersey was formed. In the fall of 1975, MITS released its 4 K and 8 K BASIC interpreters, SwTPC introduced their 6800 based microcomputer, and the first decade of amateur computing was complete. Since then, the field as we know it today has rapidly matured and expanded. Some Microprocessor History Intel Corporation must be credited with developing the microprocessor, the single chip integrated circuit which performs the basic functions of a central processing unit. In 1969, a Japanese company, Busicom, contracted with Intel to develop a chip set for a printer-calculator. It used a 4 bit data bus and consisted of four integrated circuits in a set: a processor, read only memory with IO, programmable memory with IO, and a shift register type memory. Busicom permitted Intel to market the chip set for noncalculator applications, and the first generation of microprocessors was born. The processor chip was designated the 4004, and it sold for $200. It came in an 18 pin dual in line package (DIP) and would interface only with the other chips in the family. Programs had to be stored in the erasable read only memory. Data and address information was multiplexed on the 4 bit bus. Since program could only be executed out of read only memory, and since progammable memory was used only to store data, debugging software proved to be difficult. Further, a great deal of support logic was required. At nearly the same time, Datapoint, a manufacturer of intelligent terminals, contracted with Intel and Texas Instruments to produce a true processor on a chip. Intel succeeded in doing this. Unfortunately, the device proved to be too slow for Datapoint’s use. Intel decided, therefore, in 1971, to market the device for $200 and call it the 8008. It marked the first generation of “true” microprocessor integrated circuits. The 8008 used an 8 bit data word with a more powerful instruction set than the 4004, but it still had many of the disadvantages of the 4004. It required considerable support logic. The 8008 however was a more general purpose device. For example, it contained a set of logical operations that the 4004 did not have. Its instruction set was similar to a minicomputer’s, and it could directly address 16 K bytes of programmable memory. It even had interrupt capability. At the same time, Intel introduced the 1101, a 256 by 1 bit programmable memory (which enabled the experimenter to build a 1 K by 8 bit memory with only 32 integrated circuits! ), and the 1702 256 by 8 bit EROM. With the 8008, 1101 and 1702 integrated circuits, general purpose computers could now be built. In 1972 several other manufacturers recognized this emerging market. Most notable was National Semiconductor who introduced the IMP-16, a chip set which may have been a little ahead of its time. It was a bit slice system of variable word length and user definable instruction set. It later developed into the third generation Pace microprocessor. In late 1973, Intel introduced the 8080 processor, and, soon after, Motorola introduced the 6800. The 8080 has become the de facto industry standard, used in more applications than any other processor. The 8080 is basically an enhancement of the 8008. It came in a 40 pin dual in line package and could directly address 64 K bytes of programmable memory and read only memory. It had a true bidirectional data bus and an expanded instruction set. However, it still required an external clock and multiple power supplies. The 6800 on the other hand required only one TTL compatible power supply, had simpler control circuitry, and an instruction set more compatible with larger computers. 1975 and 1976 saw the introduction of enhanced third generation microprocessors. The Zilog Z-80, an enhanced 8080, featured a larger instruction set, more registers, on chip clock, and more. The 6502, from MOS Technology, was an enhancement of the 6800. The Texas Instruments TMS9900 and TMS9980 became the first widely available single chip 16 bit microprocessors. 1977 marked the introduction of the fourth generation of microprocessors. In fact, these devices now could be called microcomputers in a single integrated circuit. These new devices include the complete microprocessor, read only memory, programmable memory, and IO circuitry on one chip. A minimum of support logic is required. Geez, I remember getting my first TRS-80, Level II with 16k of RAM. I knew a couple of computer hobbyists, but they had to program everything, while I could buy programs for the good ol’ Trash 80. I can’t confirm it, but there’s this rumor that Radio Shack still has a warehouse full of TRS-80s and the TRS Color computers. Any truth to that rumor? Funny…I worked in Springfield NJ in 1978 on big computers at Dun & Bradstreet. And I was working with a friend who’d designed and built his own 6502-based computer. I never met Sol Libes, but I remember that photo of Amidon’s Spider. In mid-1977 I bought my first Apple ][…and by January 1979 I’d moved to Cupertino to join Apple. This was a great article, with more than a few items of interest I intend to look up (and perhaps purchase, if I can find them). I’m a collector of old microcomputers and old computer stuff in general – my “pride and joy” is an Altair 8800 that needs restoration. @kedamono – I doubt there is any truth in the Radio Shack warehouse story; if there were, I’m sure it would’ve surfaced and been noted on the few Color Computer forums I’m involved with (I still have my CoCo 2 and 3 from when I was a kid – both still work great!). Even so, stranger things have happened (not too many years ago, a prototype of the CoCo 3 surfaced from Microware, who developed OS-9 for the Color Computer; I think most of the CoCo 3 machines left in the world are with Mark at Cloud-9). Most of my other stuff is of more recent vintage (I do have some old core memory, though – nothing likely workable, except for one large 16K PCB – it might work, if I had any clue as to what its card-edge pinout was); I have a couple Apple IIgs machines, plus an old Tomy personal computer (that’s a fairly rare Japanese beast from the 80s). Most of the rest of my collection is made up of books and peripherals (and a ton of software). Little known fact Roger Amidon later went on to work for an electrical utility in India. Andrew…. check out my YouTube and flickr pages. @jayessell: I believe it; I’ve seen it before (while looking thru youtube for old computer animations) – but thanks for posting it here. I have an old Creative Computing magazine that goes into depth on how to combine graphics of the time with conventional photography techniques to make some unique effects and pictures. I was constantly playing around with graphics on my CoCo at the time (got some of Lee Adams’ 3D stuff from his books working on my CoCo 3 while in high school). Back then, I dreamed of what we have now, and was always trying to make things (with my limited skills of the time) look as good as the best I saw (and to be honest, I never got close – but I had fun trying). Pretty Cool Jayessell. I made a flag waving animation on an apple //+ in high school. low res graphics. Your animation was fantastic. Very interesting article. I wouldn’t like to have had the task of finding bugs in the Spider! Jay, thank you for proving that the light does go off inside the refrigerator when you close the door. A bug in that computer is more likely to be six-legged than electronic. Maybe a few four-legged friends as well.